In Cape Bushman folklore the Mantis is the most popular hero, he has been gifted with supernatural powers yet exhibits a great deal of foolishness. He is sometimes mischievous — sometimes kind — but at all times very human, his wife is the Dassie (rock rabbit). They have two young Mantis children, a son and a daughter — they have also an adopted daughter, a Porcupine, who is married to a person called Kwammanga — he is not identified with any animal but can be seen in the rainbow. This strange couple have two children — young Kwammanga, who is brave but quiet like his father, and Ichneumon (of the mongoose family) who is a great talker — she is forever lecturing the Mantis on his foolishness. The Blue Crane is the sister of the Mantis. “People of the Early Race”. The “Mantis People” in Zimbabwe. According to Bushman legend —‘animals could talk and were indistinguishable from humans. The ‘first people’, who were the legendary ancestors of present-day Bushman, were believed to have been unintelligent, uncivilised and dangerous. Only after a second ‘Creation’ was the order of the world truly established. Animals and Humans were separated for evermore’. So who were these ‘Mysterious Beings’ who appear on so many examples of Rock Art spread across Southern Africa. 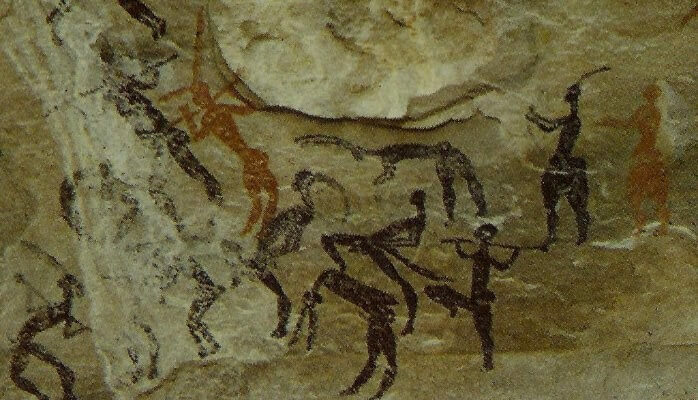 On occasion, UFO abductees have seen ‘Mantis’ like Beings who were assisting the ‘Greys’ — but looking closely at the paintings they seem to have been an integral part of ‘OUR’ civilisation, albeit thousands of years ago! So it may be the “Mantis People” have been around for a very long time – monitoring us, and guiding us in directions we would not believe! An “Insect” like creature carrying an unknown device at Leeuwkraal, Wodehouse, South Africa. The person standing next to it gives an idea of the size of this “Being”, and also shows that humans of that time were in contact with them. And then we have the strangest one of all. It must be noted this picture was taken 45 years ago, before the age of photo-shop and in a time when ‘Rock Art’ in remote places was virtually unknown. Chaos ensues as Man and Animals are swept away. And in the center of it – a bespectacled “Mantis” like Being. ‘His time was finally over’.